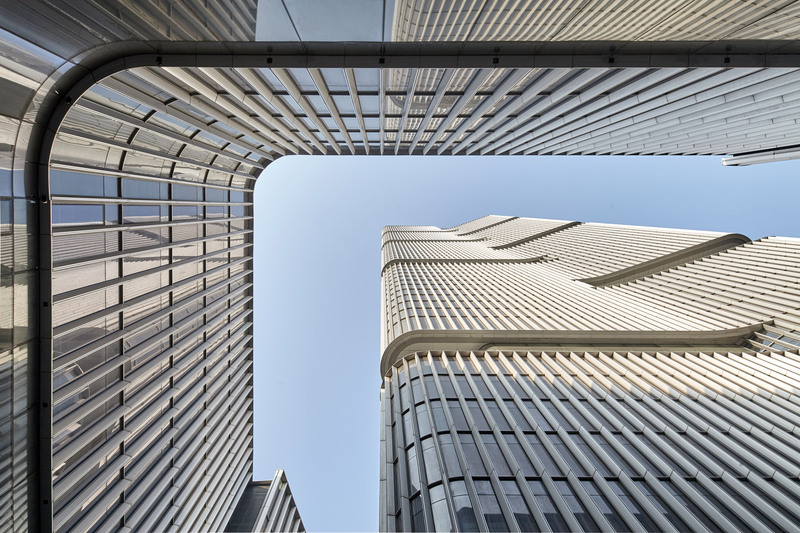 Gerkan, Marg and Partners has completed twin 284-metre skyscrapers that dominate the skyline of Zhengzhou, China. 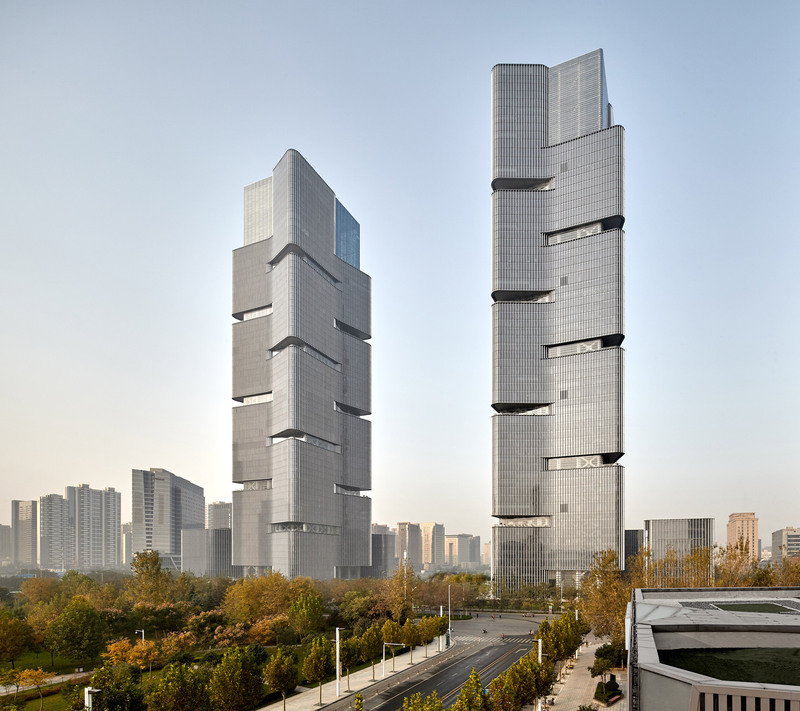 Two glass towers, which rise from L-shaped plinths either side of a square, have recessed “sky lobbies” positioned on alternating sides of the building. German firm Gerkan, Marg and Partners (GMP) won the competition to design the Greenland Central Plaza for developers Zhongyuan Real Estate in 2010. The mixed-use development contains offices and apartments, as well as leisure facilities. The topmost eight levels of each skyscraper is given over to a “sky atrium”, filled with shops, restaurants, culture and arts spaces and a spa. 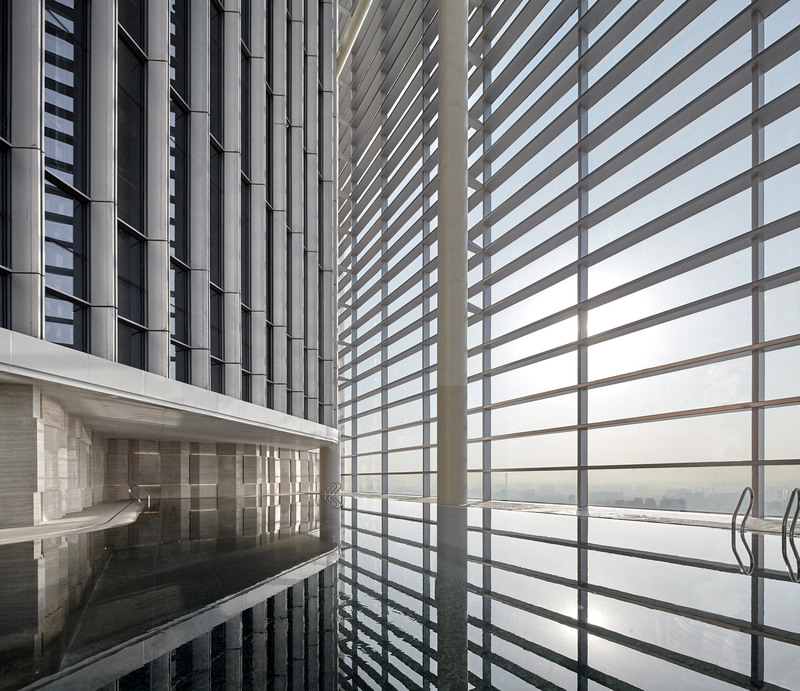 Slim vertical louvres provide shade and add to the rippling effect of the facade. 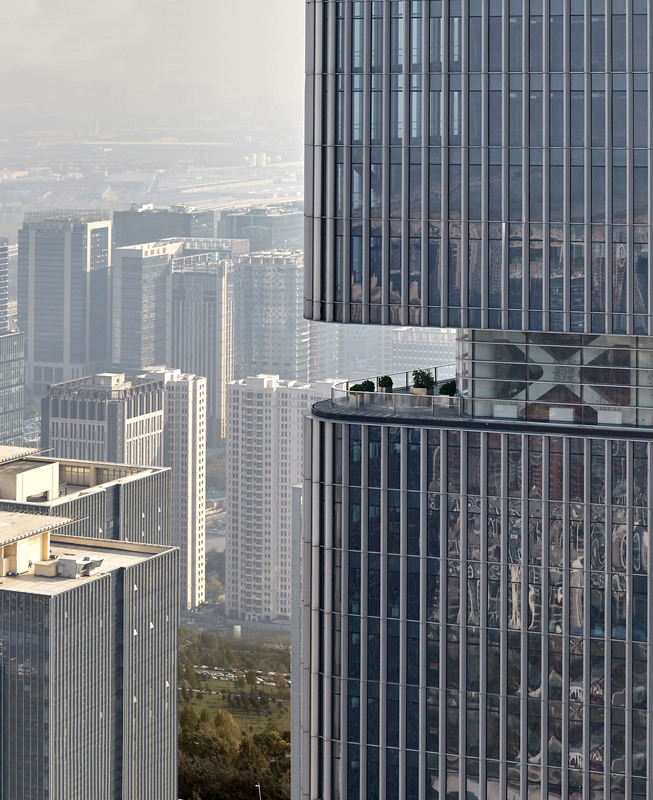 Every eight floors of both 63-storey towers has an outdoor terrace where occupants can look out over the city. Offset floors radiate out from a square core in a pinwheel fashion, creating a gently undulating facade that shelters the outdoor terraces. Local businesses will occupy the offices, which are naturally ventilated by concealed openings in the facade. 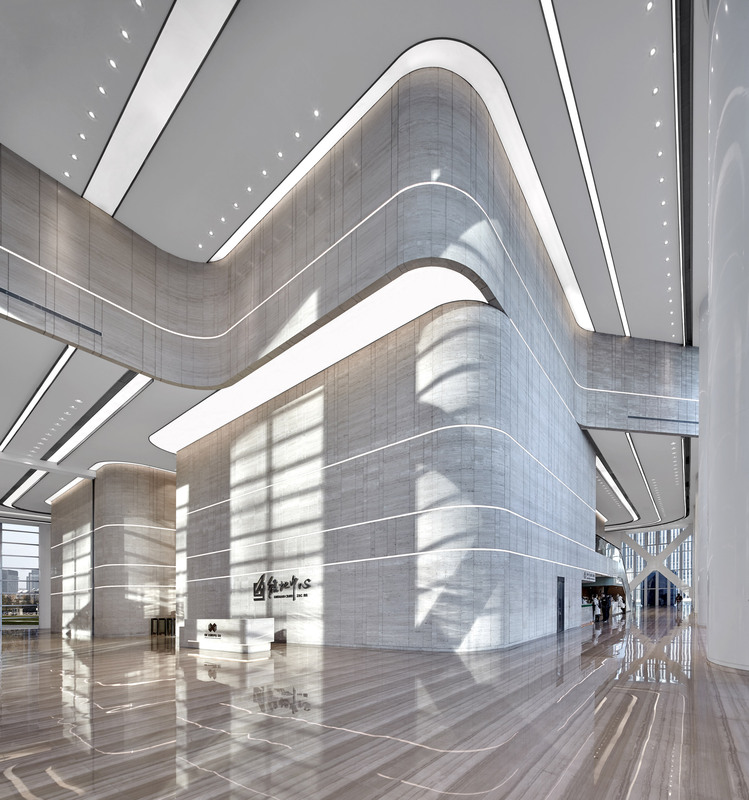 In total, the complex has created 746,000-square-metres of floorspace. Set on the eastern side of Zhengzhou near the new train station, the development was built as a response the predicted population rise. The capital of Henan Province is expected to have 11 million inhabitants by 2020. London-based architecture firm Tonkin Liu won a competition in 2016 to build a an entire family of towers in Zhengzhou. The Cradle Towers of Zhengzhou features five towers topped with greenhouses arranged around a central plaza. Hamburg-based GMP is the firm behind the Baku Crystal Hall in Azerbaijan, which was designed and built in order to host the Eurovision Song Contest in 2012. Last year they won a competition to create a roof for Verona’s Roman arena with their retractable scallop shell design. Main image courtesy of ZMG, all other photos by Zeng Jianghe.